The Sinn 757 UTC DIAPAL features an all Tegimented case construction. Standard steel used by most watch companies has a hardness of between 200 and 240 HV (Hardness Vickers is a common scale used to measure material hardness). The Tegiment layer has a hardness of 1,200 Vickers which is up to five times harder than standard steel. Finally, this watch is the perfect size for today's tastes - 43 mm. Sapphire crystal with luminous hands and hour markers. Watch is water resistant to 20 ATM. Verified Owner Comments: I just got this watch (been lusting over it for years). The watch is absolutely beautiful in person. Very nicely made and a work of art! It came with the metal bracelet and also the leather band. Very nice package, cant stop looking at it. Verified Owner Comments: The newly purchased Sinn 757 DIAPAL Tegimented watch design and quality is beyond my expectations. 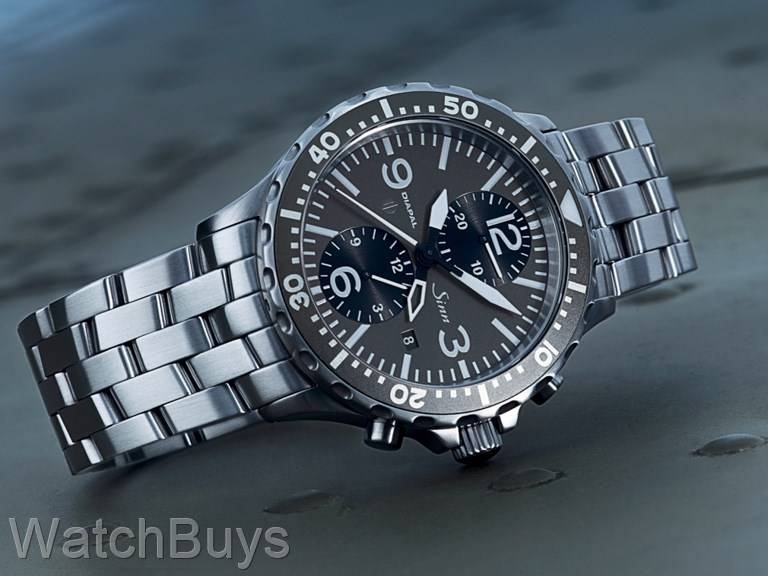 This watch is all "Fit-Form-Function", true precise German engineering (einfach spitze) IMHO buying watch on the internet is a gamble but Watchbuys made the sale a pleasant experience and I might add that the after sale support received from Matt is simply outstanding.